> Dark Roast Ground Coffee, 1 lb. Find your darker side when you try Dunkin' Donuts® Dark Roast ground coffee. The complex aromas and intricate flavors will tantalize your senses and leave you wondering why you ever chose a lighter brew. This carefully brewed mix delivers 100% Arabica beans roasted darker for a bolder, richer taste with the signature smoothness you'd expect from America's Favorite Coffee. Dare to be bold, and order a 1 pound package of our premium dark ground coffee for a full-flavored experience. Customers love Dunkin' Donuts® coffee so much that we serve around 2.7 million cups per day, and that number doesn't include the 77% of American coffee drinkers that get their fix at home. Our coffee is loved by millions because of the high quality standards we maintain and the 100% Arabica beans we put into every blend, which the industry regards as a superior grade of coffee. 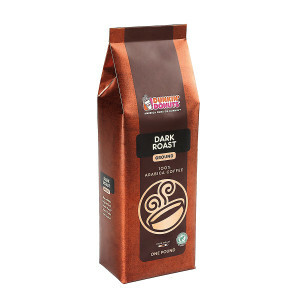 When you want to add a little excitement to your coffee routine, try Dunkin' Dark® ground coffee at home or at work. The experience begins with an impressive aroma and continues to surprise you until the very last drop. Due to the longer roasting time, our dark variety contains less caffeine than milder blends. However, this dark roast features a mix of sensations that reveal something new and delightful with every sip. It begins with a bittersweet scent that resembles dark chocolate, which is complemented by a nutty and woody flavor. In the afterglow of your enjoyment, you will be left with a subtle fruity taste that completes the symphony of sensations. Stimulate your taste buds by adding Dunkin' Donuts® Dunkin Dark® to your coffee routine.